Faroe Ponies (also known as Faroese Island Horses or Danish Ponies), are small ponies, they are between 115 cm -125 cm tall. 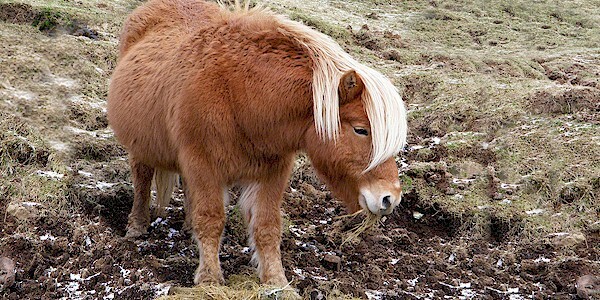 Because of their height technically they are a pony, but people on the Faroe Islands call them horses, because of their strength. Faroe horses are an iconic image of the Faroe Islands. They have been on the Faroe Islands for many hundred years. In the 1960s there were approximately 5 - 6 horses left on the Faroe Islands because of the huge export on horses to the mines in the United Kingdom. With a huge effort, that number has now increased to about 50 horses and the aim is to maintain and develop them further. They are mainly brown, red, and black. They are very hardy, friendly, adaptable, and surefooted with 3 gaits - Walk, Trot, and Canter. In the past they were used to haul heavy loads and when they were not at work they were released onto the mountains where they roamed free. Today it is mostly used as a riding horse for children who want to learn the art of riding.